I am at the epicentre of a six-year long movement against a project claiming to bring the largest foreign investment to the country. But can see no visible signs of protest. I almost draw out my camera at the sight of red and yellow banners fluttering and a podium being set up at a corner of a field. But soon discover the activity is for a volleyball tournament in the evening. A few years ago, the world's third largest steel maker, Pohang Iron and Steel Company, announced its intention to set up a 12 million tonne steel plant and a captive port at Jagatsinghpur. 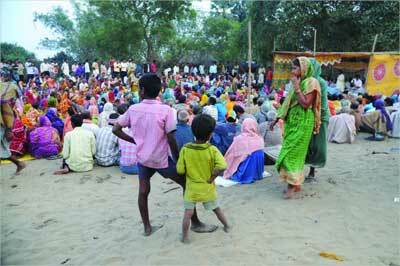 The 22,000 people from Dhinkia and three adjoining gram panchayats did not want the project. They did not want to lose their 'paano dhano meeno', (betel leaves, rice and fish). They cared little that their sustenance had no place in the books of those talking about growth and high GDPs. 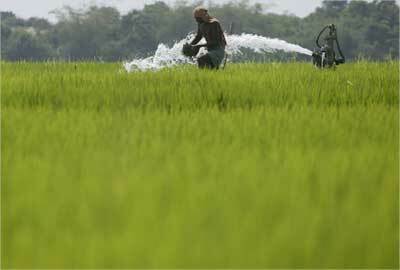 Image: A farmer works in a paddy field in Dhinkia village. Sitting cross legged on the sand, Abhay Sahoo, the leader of POSCO Pratirodh Sangram Samiti (PPSS), told me, "Jairam Ramesh will allow the project with conditions- that's my information." I nodded in agreement. It was only recently that the Reserve Bank of India lamented how the so-called 'green' policies were making the country lose precious FDI. POSCO was threatening to move to Karnataka. The South Korean President was speaking to the Indian Prime Minister. The build up was near perfect. The sand laden landscape bordering Dhinkia; in the center is a betel vine locally known as 'baraj. A tired Dhruvacharan Swain repeated what he had told scores of reporters, activists and government officials. There was a minor fortune he was being asked to forsake: betel vines earning over hundred thousand rupees every year, cashew plantations adding another 20 thousand, an acre of land producing enough rice to feed his family of 10 - a minor fortune. "We have lived off these lands for more than four generations and I don't want my son to labour in a steel factory." 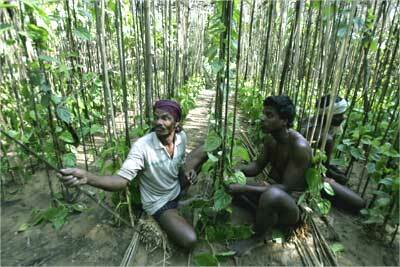 Image: Farmers work in a betel leaf farm. I decided to walk up to where river Jatadhari meets the ocean, the site for POSCO's captive port. But people from Dhinkia refused to accompany me. There were criminal cases against them and they do not venture outside the village for the fear of being arrested. I pestered a diabetic Toofan Swain to walk the four kilometres up and down. Toofan, a farmer turned trade union leader from Paradip had excitedly joined me when I told him about a visit to the POSCO sites. With an if-you-say-so-what-can-I-do look, he started walking with me. After crossing the village we entered an expansive sandy landscape dotted with scrubs, numerous upturned rectangular boxes, betel vines, cashew plantations and patches of green surrounding ponds. The January sun scorched our senses and sand dunes as high as 40 feet blocked our view. I realised the significance of this topography after a conversation with Madhumita Ray from Action Aid. She came to Jagatsinghpur in 1999 to rehabilitate victims of the super cyclone. "The toll was substantially low in villages like Dhinkia, Nuagaon and Gobindapur, although they were in the direct pathway of the cyclone. 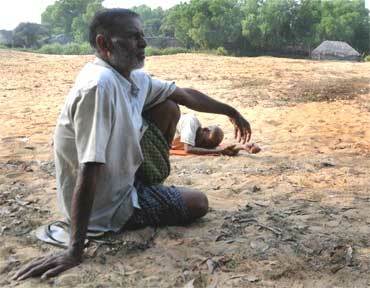 What protected them were the massive sand dunes and mangrove forests bordering the villages." The mangrove forests were the 'coastal border soldier', Madhumita told me, "and building a port here tantamounts to getting the ocean right at your door." The same sand dunes act as giant filters, stripping away salt from seawater, as a result of which the ponds brim with sweet water. The 'sweet sand' is a perfect habitat for the betel vines which gives employment to local people round the year. Image: Dhruvacharan Swain, moments after the ministry's nod to the project. What about the forests? I wondered. Madhumita handed me an excellent piece of research into the history of the region, prepared by Leo Saldanha and Bhargavi Rao from Environment Support Group, Bengaluru - Tearing through the water landscape. A 1961 forest department notification, I read, designated the forests and wastelands of the area as protected and acknowledged rights of individuals and communities. The sarpanch of the Dhinkia panchayat, Sisir Mahapatra, had papers dating back to 1931 relating to cooperatives for sharing the forest produce. When he submitted those documents to the Odisha government, it claimed they were forged. The possibility of a legal challenge was nullified when the administration slapped more than 600 criminal cases on villagers in Dhinkia. I and Toofan dragged ourselves through the sand and reached Dhinkia. By then news had filtered in that the environment ministry had given its nod to the POSCO steel plant and port, with a sprinkling of conditions. The state government had certified that there were no traditional forest dwellers in the area, and the Centre claimed to have gone by the state's report. Seemed somewhat absurd since the Centre's own committees had rubbished such claims and had said there were a few scheduled tribes and a number of other forest dwellers in the area. Image: A farmer takes his cattle for grazing. As evening descended over Nolia Sahi (nolia means fishermen in Oriya), I could see fishing boats crawling the horizon of Jatadhar Mohan, the creek where river Jatadhari meets the ocean - the site of POSCO's captive port. Toofan chose not to join me this time and stayed for the volleyball match. Rini Mudali at the POSCO transit camp Soon, women got busy sorting the day's catch. 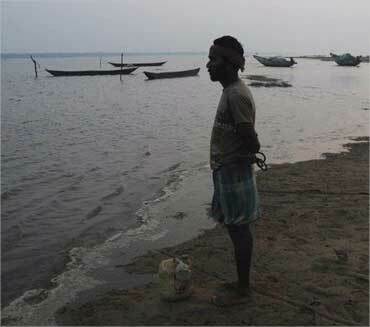 Although the environment ministry order has asked POSCO to build a fishing jetty for 153 affected families in the village, a calm Sumonto Behera told me he has to go deeper and far away into the sea to fish. "My new village will no longer be next to the sea," he rued before being interrupted by scrawny teenagers hopeful of a prospective job. The catch is on the decline, anyways, they said. I called it a day. 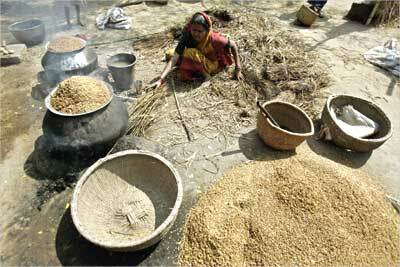 Image: A farmer's wife is seen boiling husk. "What is there to be happy about this manjoori (clearance)? I have been living here in a 15 feet by 15 feet room for the past three years. The government gives me Rs 20 a day to feed my family of four. I have sold my ornaments to make ends meet. My husband can't even find work as a daily wager, my children have stopped going to school. And we left our betel vines, paddy fields, cattle, everything for POSCO. It's better to have died in my own village than be here." I am at the POSCO transit camp in Badagabapur, 10 km from Dhinkia, literally in the middle of nowhere. Thirty-five-year old Rini Mudali's voice is thick with the pain of forced exile as she talks. Rini, along with 78 other families, came to the transit camp in 2007 after the anti-POSCO movement turned violent. The administration pitted villagers from Dhinkia, Nuagaon, Gobindapur and Nolia Sahi against each other and politicians deepened the divide. 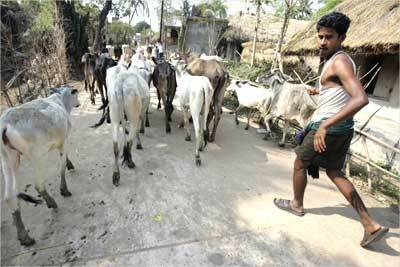 Now, a villager from Dhinkia cannot dare step inside neighbouring Nuagaon. Image: Outside the POSCO transit camp. The battle lines are drawn by labeling ordinary villagers as either 'pro' or 'anti' POSCO. In the states' version, for instance, Mudali would fall into the 'pro' category. Baino Mohanty, another villager at the transit camp told me, "the productivity of the betel vines declined sharply with rapid industrialisation in the neighboring Paradip. Steel and fertiliser factories and oil refineries have mushroomed in the past 20 years close to where we stay. Farming has no future here, it's wise to accept POSCO and bargain for a better compensation package and jobs." A bunch of teenagers arrived with posters to celebrate the Union ministry's approval to the project. They asked me to take a photograph. I obliged with a smile. 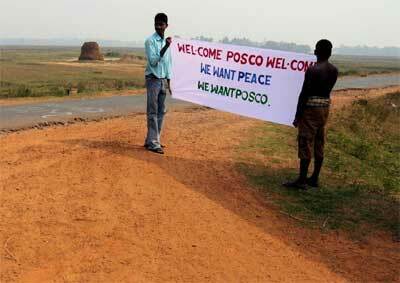 The poster read: WE WANT PEACE, WE WANT POSCO. Check out the world's highest hotel!